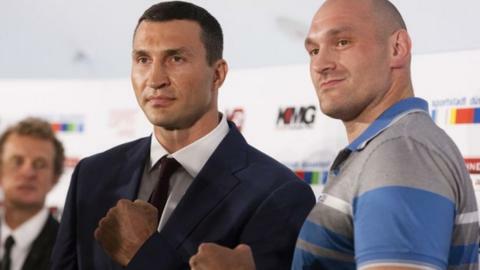 Wladimir Klitschko's world heavyweight title bout with Britain's Tyson Fury has been provisionally rearranged for Saturday 28 November in Dusseldorf. Klitschko, 39, had been due to defend his WBA, IBF and WBO titles against Fury on 24 October in the German city. However, the Ukrainian, unbeaten for 11 years, withdrew from the fight last week, citing a calf injury. Klitschko and Fury await the agreement of broadcaster Sky Sports for the fight to proceed on that date. Bolton fighter Fury revealed on Twitter that his opponent had been declared fit to fight on 28 November. Last week, the 27-year-old had attended a news conference dressed as Batman during the build-up. Fury - who called Klitschko "boring" in July - had taken his seat at the event in London before he leaped over his table to grapple with someone dressed as Batman's enemy The Joker. Fury - who is undefeated in 24 fights - successfully defended his European title in March and will tackle Klitschko in his record-breaking 28th heavyweight title bout.